My research experience are diverse but broadly encompass how humans affect natural communities and the ecosystem services we depend on. My research focuses mainly on pollinators (bees), and how changes in human land-use practices affect patterns of bee abundance and diversity, as well as the sustainability of pollination services. 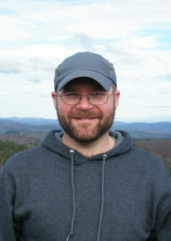 More recently, I also began collaborating on a project studying how introduced host plants impacts the chemical ecology of plant-insect interactions. Though varied, these lines of research are critical for addressing plant and insect conservation in a world where human activities have had and will continue to have dramatic effects on the biodiversity and resilience of natural communities. ​I am currently collaborating with Deane Bowers (CU-Boulder), Angela Smilanich (UNR), and Nadya Muchoney (UNR), on an NSF-funded project examining how the incorporation of novel introduced host plants impacts interactions between caterpillars and their natural enemies. A growing body of evidence suggests that the insect immune system plays a vital role in structuring interactions between plants and their insect herbivores. Humans can directly alter these relationships through introducing novel hosts, but also indirectly through shifting plant distributions in relation to human-induced environmental change. Together, we are studying three nymphalid butterfly species: common buckeyes (Junonia coenia), Baltimore checkerspots (Euphydryas phaeton), and white peacocks (Anartia jatrophe), all of which can feed on the introduced narrow-leaf plantain (Plantego lanceolata). Specifically, we are exploring how this host shift impacts the sequestration of defensive chemicals, immune function, and defense against both pathogens and parasitoids. Through a combination of field research and laboratory experiments, we are disentangling the role of host-plant chemistry on caterpillar immune function, and its implication for the evolution of herbivore diet breadth. Rural areas often provide excellent habitat for wildlife. However, cultural and agricultural practices are major factors driving the abundance and diversity of many different types of plants and animals. Bees are of direct concern to many farmers and ranchers, given their role as pollinators for many food and forage crops. Together with researchers from Colorado State University, the University of Colorado Boulder, and the University of Wisconsin Madison, we surveyed bees across agricultural landscapes in Eastern Colorado (see Collaborators). We hope to identify agricultural and conservation practices that promote native bee abundance and diversity, as well as potential risk factors for native bees. Urbanization is a dominant form of land-use change that has been implicated in the decline of native pollinators, though it's effects likely depend on the type or intensity of development, the surrounding habitat, and the availability of foraging and nesting resources within the landscape. For example, suburban developments are less intensively developed and in some areas can promote abundant and diverse bee communities. 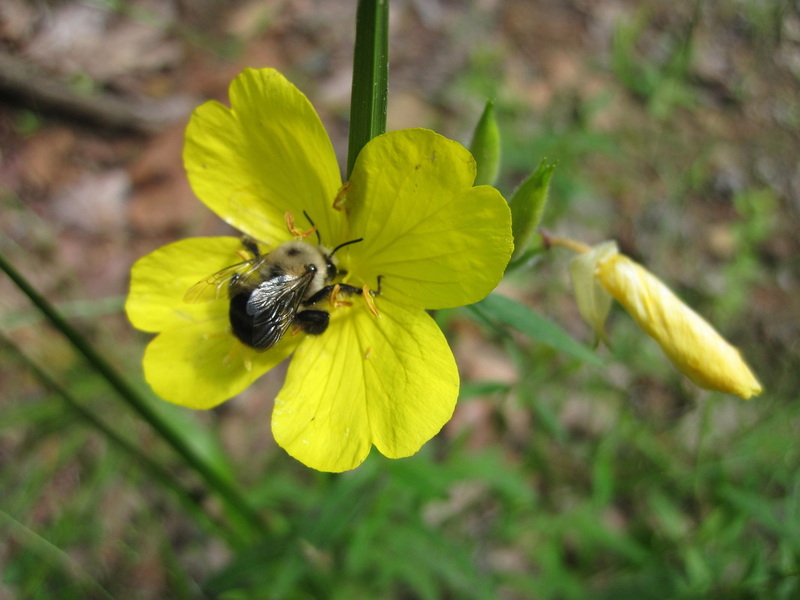 Along with Rebecca Irwin at NCSU, and Lynn Adler and Paige Warren at the UMASS-Amherst, I studied bees across suburban and natural forests in the Raleigh-Durham area of North Carolina. 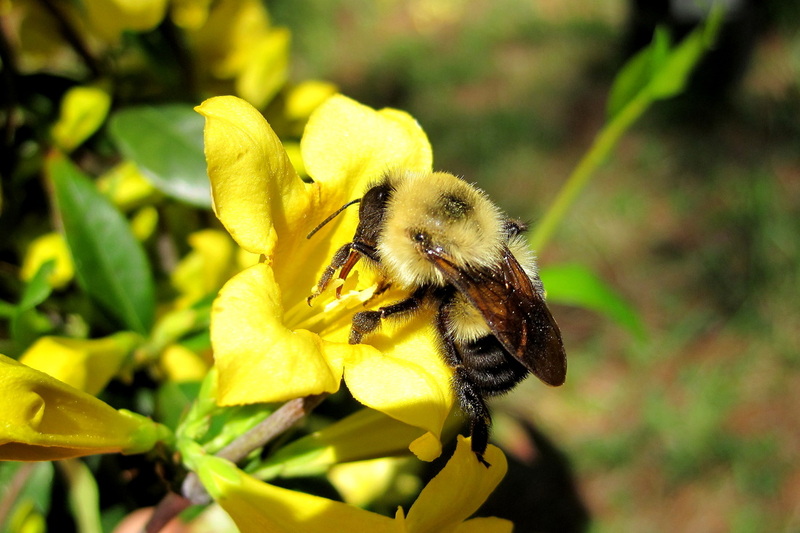 Suburban forests have more bees than natural forests and at least as diverse communities. This appears driven primarily by the abundance of flowering plants in suburban forests and the amount of developed open areas, such as yards and roadsides in the landscape. 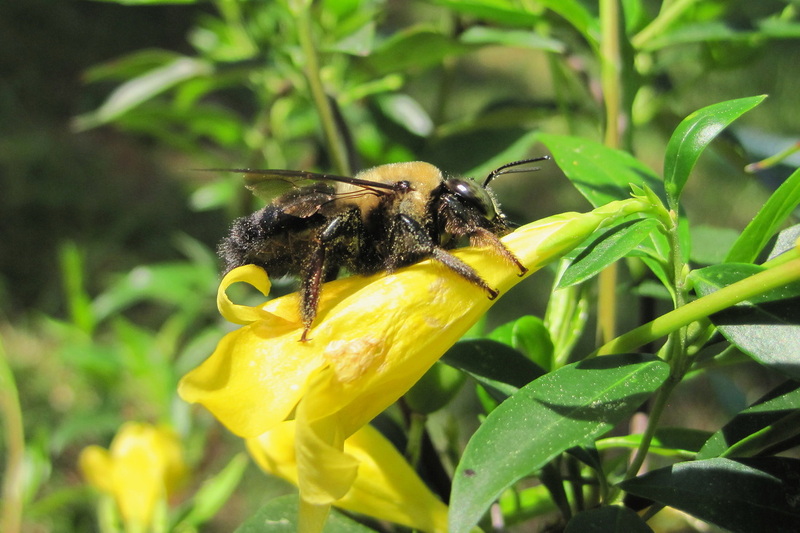 To determine whether greater bee abundance associated with forests in suburban development translated into increased pollination services, we experimentally manipulated pollination in three native, bee-pollinated plants: Gelsemium sempervirens, Oenothera fruticosa, and Campsis radicans. All three flowering species were pollen-limited for some measures of female plant reproduction; however, contrary to our predictions, plants growing in suburban areas were more pollen limited for both fruit and seed set. These results suggest that even though suburban areas have relatively abundant and diverse bee communities, native plants growing in suburban areas do not benefit through increased pollination services. Changes in land-use can also have indirect effects on native species persisting in human-dominated environments through changes in species interactions. Most plant species interact not only with mutualistic pollinators but also a number of antagonistic visitors. In addition to mutualist pollinators, Gelsemium also interact with floral herbivores (hereafter florivores). 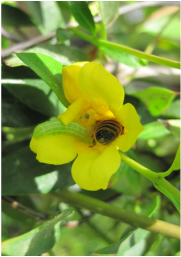 A greater proportion of suburban Gelsemium experience florivory which could affect pollinator visitation and be an important driver of pollen-limitation of fruit and seed set in suburban compared to natural forests. 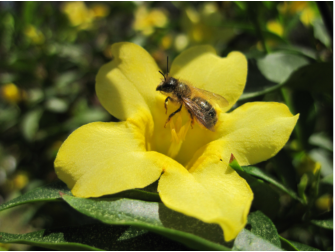 To understand the role of florivory in driving pollinator behavior, pollination, and Gelsemium reproduction, I experimentally manipulated both florivory and pollination in a common garden experiment. I found that floral damage reduced visitation to plants, and subsequently pollen donation, an estimate of male function. However, contrary to predictions floral damage had little effect on female reproduction. This suggests that the effects of floral antagonism may have stronger consequences for male than female reproductive success.